Anyone at all involved in evangelism (especially ministry to atheists) will likely encounter at some point the claim that the Church stole the story of Christ's life- birth, teachings, death, resurrection and future return-from the ancient pagan cult of Mithra. The "informed" critic of the Christian faith will claim that Mithra was born in a manger, worshiped by three shepherds at birth, ascended to heaven, and promised to come again at the end of time to judge the quick and the dead. Thinking themselves wise, and to have handily refuted the life of Christ, they will proclaim victory. But is any of this true? Are the gospel accounts really just a retelling of the Mithraic myth? Let's examine the claims carefully. CLAIM 1: Mithra was born on December 25th, in a cave, and worshiped by three shepherds. As with most lies there is a mix of truth and falsehood here. The mention of December 25th is designed to attack the gospel account of the birth of Christ, since most Christians observe his birth on that date. However, the date has absolutely no scriptural validity or significance. The date does not come down to us through Apostolic Tradition. The only reason the later church chose that date is because it was a date distinguished by festivities in many cultures. In fact, some Christians observe the celebration of his birth on January 7th. We don't know for certain the date of his birth, and the date is irrelevant. So this point is really nothing significant. Now, what about Mithra being born in a cave? The fact of the matter is, Mithra was not born in a cave, but out of solid rock. According to what little scholars know of Mithraic mythology, Mithra emerges from this rock, wearing his Phrygian cap. He held in his hands a lit torch and spear, while red flames surround him. In fact, Mithra was born from this rock a full grown man. (see photo accompanying this article.) 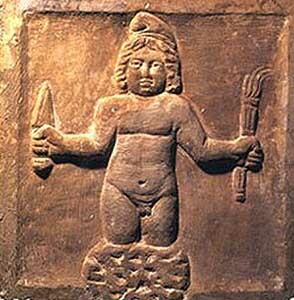 Scholars note a connection between this myth and that of Perseus. Now does this sound anything at all like the gospel accounts of the birth of Christ? What about the three shepherds? Well, three shepherds did witness Mithra's emergence from the rock, but unlike the gospel accounts (which does not specify the number of shepherds), there are no angelic messengers whatsoever. In fact, in Mithraic mythology, these shepherds are out of place, since according to this pagan myth, humans had not been created yet! CLAIM 2: Mithraism pre-dates Christianity! Wrong. Mithraic mythology came about at least one century after the time of the New Testament. What does this mean? It means Christianity could not have stolen these episodes in the life of Christ. However, if we wish to make that claim, then it can only be laid at the feet of the Mithraists, though no scholar would suggest that either. CLAIM 3: Mithra was a great spiritual master and teacher. What religion doesn't make that claim for its leader? Buddhists claim this, Hindus claim this, Muslims claim this, on and on. More to the point, there is no evidence that Mithraic scholars have found that supports this claim. CLAIM 4: Mithra had 12 disciples too. The Iranian version of Mithra had one companion (Varuna). The Roman version had two helpers, who were miniature torch bearing versions of himself, called Cautes and Cautopatres. Now, Mithra did have a few animal companions; a dog, a lion, a snake and a scorpion. Nowhere do we find in Mithraic mythology that he had twelve disciples of any kind. CLAIM 5: Mithra was also buried in a tomb and rose again on the third day. His followers also celebrated his resurrection. As we can see, the story of Mithra has absolutely no connection to, or even similarity with, that of Jesus Christ.